Woo Hoo! ”Only” 5121km (3182 miles) to go! I think this number seems a little high, but at any rate, it all depends on the route I take. But it was fun to see a sign for my end point! About 12 hours in Argentina and I can tell you things are rather different than Bolivia. The shower in the hostel was too hot (the cold water didn’t work)!! There is hot water in the sink. My room had a pleasant smell of cleanliness without awful aromas. There was an ad for Danielle Steel books on TV. Stores are well lit. Gas stations with neon signs, ad campaigns and frequent customer reward programs. Things are noticeably pricier. The accent is going to take some getting used to. Everything uses the ‘vos’ verb form. 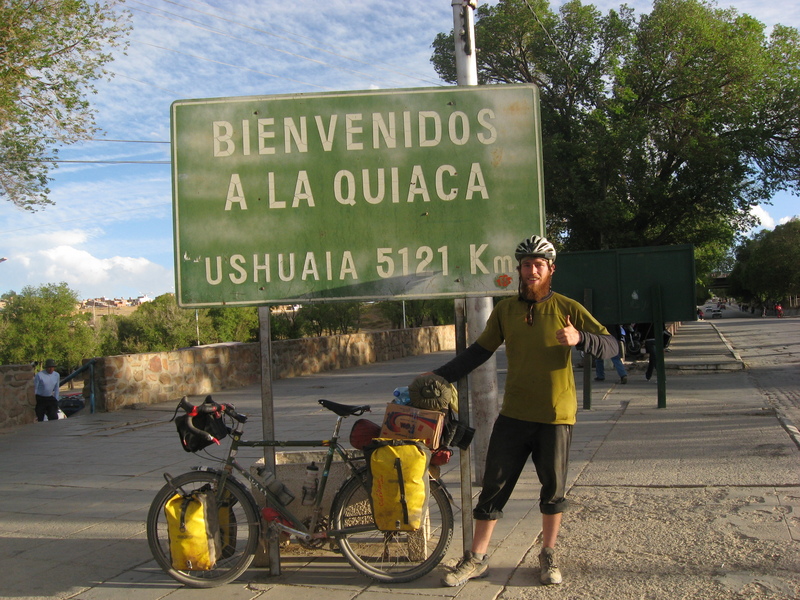 I have four more days riding before I get to Salta, where I’ll be leaving my bike and go catch up with my friend Hawk in Santiago, Chile. I´m Alejandro And work whit Adam James Irvine Moore at Manos de Vida AC in Oaxaca, we met the time you visit Adam, I just wanted to wish you a good end for your trip. Awesome that you have made Argentina! The light is at the end of tunnel down there by Antarctica! A gal from our church is in Santiago, Chile. Been there since July for another few weeks on a semester abroad program from U of Michigan. From her FB it looks like she is at the Pontificas Universidad Catolica de Chile. Lauren Kennedy is her name. Her folks are good friends of ours and she graduated from our kids’ HS a year ahead of Tim. You probably have plenty of other things to do in Chile, but just in case, look her up. I know her folks are heading that way to visit her at the end of her studies. They go Dec. 5. Keep on pedaling–but have a great time in Santiago, even if you don’t pedal that one. Congrats! I hope you had a great Thanksgiving and can’t wait to read more/see more pictures! Wow Matto, the end is in sight. 3,200 miles really doesn’t even seem that far considering the last year and a half. Keep truckin’ and enjoy the nicer amenities in Arrr-henn-teena. And I thought I rode my bike a lot! Keep it up, Matt. You’re an inspiration to all of us desk-sitters.